Fure West tanker supplied with more than 150 tonnes in truck-to-ship operation. North Sea Port - the 60-kilometre-long, cross-border port area stretching from Vlissingen in the Netherlands to Ghent in Belgium - witnessed its biggest LNG bunkering operation to date on October 16 when the chemical and oil tanker Fure West was supplied with more than 150 tonnes of the gas fuel in a truck-to-ship delivery. Eight truckloads of LNG were transferred in total to the Furetank-owned vessel, with each truck carrying approximately 19 tonnes. 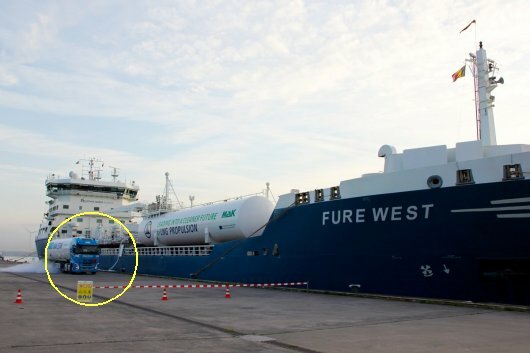 LNG product was sourced from both Rotterdam and Zeebrugge, and the delivery was carried out by Amsterdam-based supplier Titan LNG at Kluizendok, in Ghent, after the 144-metre-long Fure West had arrived at the OilTanking Ghent terminal over the weekend to unload a bulk liquid cargo. Built in 2006, the Fure West was retrofitted with Caterpillar Marine's Mak M 43 C dual-fuel engine in 2015, enabling it to run on LNG. Caterpillar also supplied the complete gas system for the tanker, including bunker stations, two LNG tanks measuring 4.15 meters by 24 meters, and the vaporizer. It is not the first time that the tanker has been involved in a milestone bunkering operation. Back in November 2016, it was also the first seagoing vessel to be bunkered with LNG in Amsterdam - with Titan LNG also performing the delivery. Commenting on North Sea Port's biggest LNG bunker delivery so far, Titan LNG's Jippe van Eijnatten said: "Because the ship does not always know where it is going to be working, it is important to be able to move quickly to arrange bunkers in different places. The communication with North Sea Port was very smooth and we were very pleased with the cooperation provided, which led to a safe and efficient bunkering operation." For North Sea Port, meanwhile, the objective is for LNG bunkering to become a "more routine" activity moving forwards. This, CEO Jan Lagasse notes, will increase the port's attractiveness and reduce the emission of CO2 and nitrogen oxides - environmental objectives that are outlined in North Sea Port's Strategic Masterplan. Furthermore, the port says it is also looking into the possibility of making ship-to-ship LNG bunkering available.